That's right, @dlux-io is taking a major step into Location Based Experiences (LBEs)! February 23rd is World IA Day (LA Tickets), where around 200 people are expected to attend and share knowledge about information architecture. Users are on-boarded to STEEM by claiming an account through dlux, providing a username. Then, a World IA Day NFT is added to their inventory, where progress can be viewed. Quest items completed with the AR camera are tracked by the NFT smart contract, and once the quest is complete the NFT activates into a trade-able token. If the quest is not completed at the event, the NFT will expire and disappear from the user's inventory. World Information Architecture Day is a global initiative with a yearly celebration manifested locally in different ways. dlux is providing turn-key blockchain solutions for empowering apps with the token economy. We think it's one of the most interesting information architectures, powered by STEEM and designed to scale. We're proud to sponsor this event and share what we've been passionately working on. Bonus: check out our logo above Verizon's. The Los Angeles design community is coming together to support World IA Day! 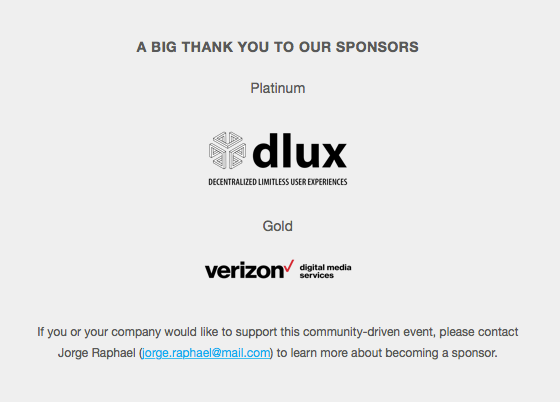 Our first Platinum-level sponsor, dlux, is even creating a special AR app, just for the event. 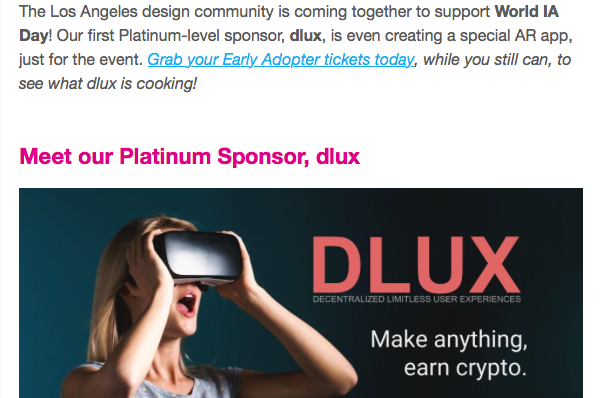 Grab your Early Adopter tickets today, while you still can, to see what dlux is cooking! 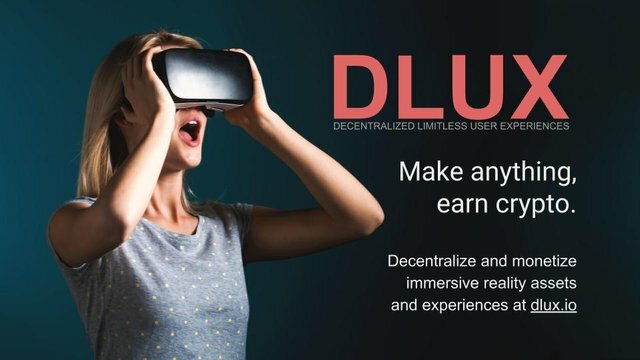 dlux (decentralized limitless user experiences) adds blockchain infrastructure to games, apps, and events, supercharging them with cryptocurrency and NFT smart contracts for the token economy. Create immersive AR and VR web apps, games, challenges, quests, and social media. Content is monetized through community upvotes for the STEEM rewards pool, and connected to create a traverse-able world users can explore in augmented and virtual reality. The code is open source and rewards those who contribute. Start creating today with dlux: make anything, earn crypto. Well done guys! This is the biggest thing, what i see, since im on steem. If all the smt projects can do just the half of your progress, the steem ecosystem will dominate the whole cryptoverse within 2-3 years. Thanks, I share your optimism. The flexibility to provide token access across any type of web interface or experience will drive a new wave of innovation in UX and UI, giving us access to new ways to design information architecture. I hope STEEM gets there too, but for now we have dlux! Im realist, not optimist. And i see, what i see. Disregardfiat (and you guys, but i dont know the details) made a better system like the smt, with a tiny budget and small time. Here you can see the different between work as employee for salary, for profit, and work as visionary, for passion and joy of creation. Awesome, just listened to the Forum recording, nice work! Thank you for the kind words and support. We definitely strive for interesting! Hello @markegiles, thank you for sharing this creative work! We just stopped by to say that you've been upvoted by the @creativecrypto magazine. The Creative Crypto is all about art on the blockchain and learning from creatives like you. Looking forward to crossing paths again soon. Steem on! Congratulations @markegiles! You received a personal award!